A group of higher secondary certificate candidates yesterday demanded rescheduling of some exams with spaces in between so that they get enough time to take the final preparations. 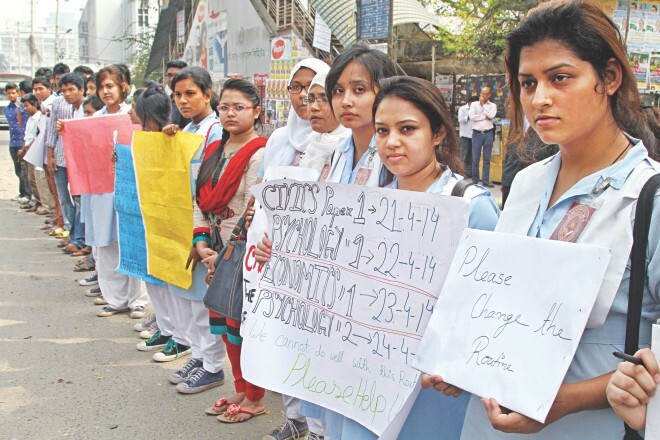 The demand came from a human chain in front of the capital's Jatiya Press Club as four exams of the humanities group are scheduled in a span of four days from April 21-24. The exams include civics paper-1, psychology paper-1, economics paper-1, and psychology paper-2. Controller of examination of the Dhaka board, SM Wahiduzzaman, however, said they could not consider the demand, as few examinees would sit for both civics and psychology exams.